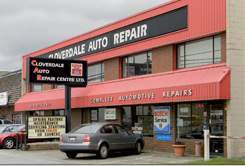 Cloverdale Auto Repair Center Ltd. was founded in 1977 and is family owned and operated. We at Cloverdale Auto Repair have been serving the Greater Vancouver area for close to 40 years. We operate a 5 bay facility with the latest equipment to service today’s wide variety of high tech, domestic, European and Japanese import cars, trucks, Suv’s, vans and recreational vehicles. All of our staff have the Red Seal certification as Automotive Service Technicians or are licensed apprentices in the trade. We have been a recognized BCAA certified repair facility since 1980. Our credentials speak for themselves. We are part of the AC Delco network of professional service providers as well a the BOSCH car service network of repair providers. We are a licensed Designated Inspection Facility for the Province of BC. We accept the Element transaction card for vehicle repairs. We are members of the Cloverdale Chamber of Commerce and the Automotive Retailer’s Association. If you are new to the area we are a long time participant of the Welcome Wagon program. Please stop in a receive your free gift. Cloverdale Auto Repair understands the needs of our customers and strives to satisfy our client’s needs by always proving fair and honest answers to their transportation and repair needs.